(NORTH VANCOUVER, B.C. )—Capilano University is the recipient of the Recycling Council of British Columbia’s 2012 Environmental Award in the Educator’s category for its forward-thinking work in sustainability. Nominated by Encorp Pacific (Canada) for waste audits conducted by the university in fall 2011, RCBC Environmental Awards recognize the valuable contribution that individuals and organizations make toward preserving British Columbia’s environment. Capilano University and Encorp performed a pilot program aimed at increasing the use of onsite containers for recyclable beverages at Cap’s North Vancouver campus. A 2010 Beverage Container Return Study found that single men between the ages of 18 to 34 living in urban areas are the highest discarders of beverage containers. A heavy discarder is defined as those who typically discard at least two containers per week (not recycle). They are likely to work outside the home or are students. Students in Cap’s Environmental Geography program and Tourism and Outdoor Rec program performed waste audits at the North Vancouver campus on September 20 and November 15. Audit results were then compiled and recommendations made that assisted Encorp in implementing this project at other post-secondary institutions. Encorp and Cap U are currently developing the work plan for another a waste audit in September. Last year’s venture involved close to 100 Cap U students who participated in the project as part of their coursework. Capilano University is a learner-centred university that serves the communities of the Lower Mainland, Howe Sound, and the Sunshine Coast through campuses in North Vancouver, Squamish and Sechelt. Opened in 1968, enrolment today totals 7,500 students in credit programs each term with an additional 7,000 people taking non-credit courses annually. Currently, 708 international students from 52 countries are studying in 43 programs at Capilano, with an estimated economic impact of $31.9 million. Capilano University offers a complete range of preparatory courses, university-level arts and science courses, business and management studies, creative and applied arts programs, health and human services programs, plus a range of services in support of student learning and success. Credentials awarded include bachelor degrees, associate degrees, post-baccalaureate diplomas, advanced diplomas, diplomas, certificates and statements of completion. Recent Cap U Accounting Assistant program grad, Emily Solomon, and her daughter, Milly, are grateful for the support received from the university and the Spectrum Support Group. (NORTH VANCOUVER, B.C. 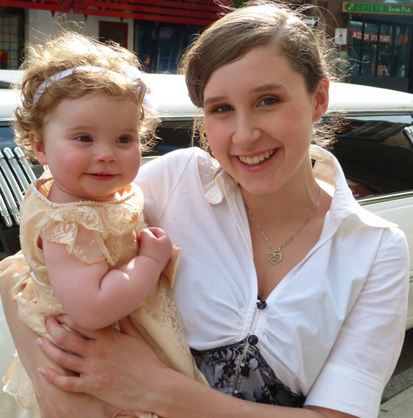 )—Mother’s Day is always a special time for Emily Solomon and her young daughter, Milly. But this year, as Solomon graduates from Capilano University’s Accounting Assistant program, the twosome has even more to celebrate. Solomon – this year’s winner of both the Spectrum and Soroptomist Awards – told her story at a recent awards breakfast for Capilano University award winners and donors. By 17, she was breastfeeding in between Math and English; by 18 she had graduated on time – in the top 10 per cent of her class and ready to enter Cap U last fall. Her daughter, Milly, came along to university, too, spending her days at the Capilano Children’s Centre. Along the way, Emily learned how to cope with the demands posed by teen motherhood, and when it was time to ask for help. One of those resources was the Spectrum Support Group, a charitable organization composed of North Vancouver mothers who mentor young, struggling moms. While Spectrum offers free, professional caregiving that gives the moms a chance to catch up on errands or sleep, Solomon felt she should leave that service to mothers she felt were more in need of it. Instead, she says Spectrum’s greatest gifts were the financial aid that helped her complete her Accounting Assistant certificate, and the inspiration she got from Spectrum’s compassionate philosophy. Solomon’s speech to the award winners and donors was a moving one. After it was finished, she was approached by Jim Belsheim, president and CEO of Neptune Bulk Terminals, who was keen to help her with the next step in her career. Within a week, she was given a practicum placement at Neptune Terminal, which begins in May. New employment, mothering, and a plan to continue on to her bachelor of Business Administration degree and an eventual Chartered Accountant designation aren’t the only items on her to-do list, though one would think they were enough. Solomon also plans to repay the kindness she has received by becoming one of Spectrum’s volunteer mentors. People who are interested in helping young mothers along the path to success are invited to learn more about the Spectrum Support Group and its annual Spectrum Award at Capilano University. Visit www.supportingmothers.ca, or call Sally Livingstone at 604.562.5530. Fourth-year Capilano University business administration student, Jessica Lau, is a recipient of a Premier’s scholarship. Jessica is one of eight British Columbian students who received scholarships valued at $6,000 to $10,000 for study abroad. Award recipients come from across the province, and will be studying in a variety of countries and institutions. Their fields of study include health sciences, the environment, business and the arts. Jessica will travel to Amiens, France this fall to study at the Picardie School of Management. She plans to use her education toward a career in program development for diversity and cultural awareness. The Burnaby resident is involved in the Capilano Undergraduate Business Enterprise of Students, helping to enhance the value of the business program. She is a past president of the student’s Human Resources Management Association at Cap, and works with the organization to provide opportunities for professional development in human resource management. Cap offers field experiences from two to four weeks duration and exchanges for a semester or a year. More information can be found here. Premier’s scholarships are funded from the returns on a $13 million endowment fund established by the Province for international education. To date, 15 Premier’s scholarships and 378 other One World scholarships of $1,000 to $10,000 have been awarded to support students in pursuing post-secondary education abroad. The Irving K. Barber BC Scholarship Society, with support from the Victoria Foundation, provides scholarships to students attending public post-secondary institutions in B.C. and internationally. The Society has awarded over $2.9 million in scholarships to date. 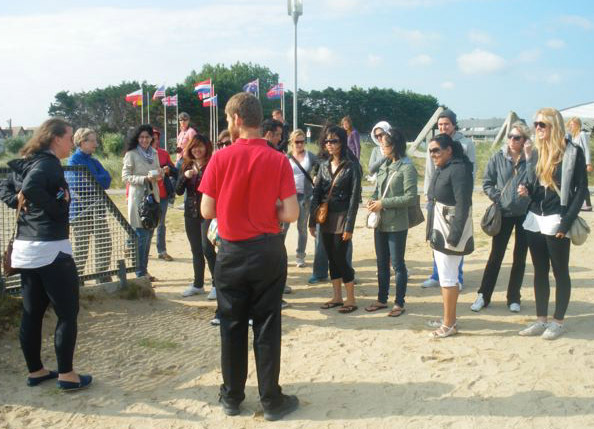 Students from Cap’s France Field School receive a guided tour of Juno Beach. Eighteen students from Capilano University had the trip of a lifetime this summer while collecting credits for their studies in European history and European business. As part of Cap’s France Field School, student activities included classroom lectures, guest presentations and field trips to important historic and/or cultural sites. Those sites include Juno Beach, Dieppe, Beaumont-Hamel (Battle of the Sommes), Vimy Ridge, the Louvre, Monet’s Garden and Chantilly Castle. Courses were taught by Cap instructors Anne Watson and Towser Jones. The students also had two 3.5 day weekends for independent travel. Their destinations this year included Barcelona, London, Brussels, Nice, and Amsterdam, to name a few. Capilano University developed the France Field School in 2010 to provide students with the opportunity to live and study in France. Participating students become residents for the month of July at a partner institution in Amiens, which is one hour north of Paris by train. For more information about study abroad opportunities, please visit the Study Abroad website. (NORTH VANCOUVER, B.C. )–Capilano University student, Yvonne Lee, who will graduate with her BBA in June, was awarded the Mentee of the Year award at a recent Vancouver Board of Trade (VBOT) Leaders of Tomorrow (LOT) awards and graduation evening. She beat students from the University of British Columbia, Simon Fraser University, the British Columbia Institute of Technology, as well as from the other colleges and universities in the Metro Vancouver area. LOT is a program run through the auspices of the VBOT, where students in their graduating year apply to the program stating their disciplines, are interviewed, and hopefully accepted. They are then paired with a mentor who is working in this discipline and has volunteered his or her service to LOT. In Yvonne’s case, her discipline is marketing and she was paired with Bruce Arthurs who is the regional director – BC & Yukon for Scotiabank. The mentor/mentee relationship develops with the mentor giving and the mentee receiving. While continuing her studies, Yvonne was hired by Scotiabank as a sponsorship and major event coordinator’s assistant. The landmark of her LOT experience was being involved in Scotiabank’s Show Your Colours, during the 2010 Olympics, where she met people from all around the world who had come to Vancouver for the Games. Yvonne started at Capilano in 2005 when she enrolled in the Retail Marketing program. She transferred to our BBA in 2007. As stated earlier, Yvonne will graduate in 2011 and she hopes to continue with Scotiabank and the VBOT Young Professionals program. 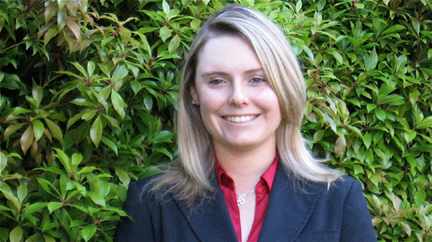 Capilano University business degree student, Mairin Platt, has won the 2010 Mercer Scholarship for HR Excellence. (NORTH VANCOUVER, B.C. )—Fourth-year Capilano University business degree student, Mairin Platt, has been awarded the 2010 Mercer Scholarship Award for Human Resources Excellence. Platt was chosen from among the top applicants from members of B.C.’s academic Benefits Consortium that offer HR programs. Applicants were given a particularly challenging case study and asked to describe, based on their classroom learning, how they would manage the HR situation presented to them. The responses were judged by Mercer, a global company providing business and human resource consulting, outsourcing, and investment services. Platt, who will collect a $2,500 cheque for her win, said she had some help along the way. (NORTH VANCOUVER, B.C. )—Fourth-year Capilano University Business Administration student, Brad Hallwood, has reached the finals of Canada’s Next Top Ad Exec, a prestigious and arguably the richest Canadian competition for business students. From the original 196 competitors from 28 universities across Canada, the top 10 will be presenting their ideas March 30 at Toronto’s Le Meridien King Edward in front of a panel of senior marketing and advertising experts representing leading brands and academia. The eventual winners will be crowned Canada’s Next Top Ad Exec and will drive away in a 2011 Chevrolet Cruze . . . no strings attached! Hallwood, a 22-year-old North Vancouver resident, says that the contest was an opportunity to go above and beyond his regular university curriculum and do something he enjoys and is passionate about. As the lead program partner, Chevrolet Canada has challenged students to create a pre-launch marketing campaign for the all new 2011 Chevrolet Cruze. The student competitors have already made their way through two rounds of aggressive competition. Their final marketing pitches are closely guarded secrets that will only be divulged in front of the judges at the end of the month. The complete list of finalists is published at http://www.topadexec.com.